In the year 1527, it was decreed in one of the Galway Statutes that “At no time to use ne occupy ye hurling of ye little balle with the hookie sticks or staves, nor use no hand balle to play without the walls, but only the great foot balle”. It seems the authorities of the day were trying to limit the playing of hurling, but they might as well have tried to hold back the tide. When you think of it, apart from the language, we have nothing more Irish than the game of hurling. It is an ancient team game, Gaelic in origin, its traditions set back in the mists of history. It has common Gaelic roots with shinty in Scotland, bando in England and Wales, and cammog in the Isle of Man. It is the fastest game in the world on grass and one of the most skillful, it requires agility, bravery, fitness, strength of wrists, hand-eye coordination, and teamwork. It generates communal spirit, a deep seated territorial loyalty where amateur players compete “for the credit of the little village”. The game is older than recorded history. It was originally played between villages with hundreds of players on each side. Later it was landlords who gathered teams of their tenants to play against other landlord teams. The strength of the game ebbed and flowed with emigration trends. The great strength of the GAA down through the years has been the club structure which has always guaranteed intense competition. Most clubs and many schools now start the boys and girls training at a young age, developing their skills. Anyone who ever lifted a hurl will remember the thrill of soloing with the ball for the first time, you were faster than the wind, the thrill of your first ground stroke to go up in the air, the sheer joy of the first time you put it over the bar. Our photograph today is of a group that surely experienced some of those little highlights. 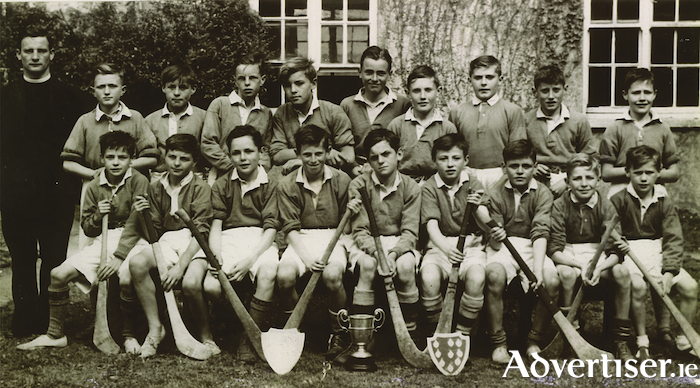 The Patrician Brothers used to run a hurling league in the Monastery School, and our image is of the St Nicholas’ team that beat St Patrick’s in the final of that competition in July 1949. They are, back row, left to right: Brother Fabian, Fred Bray, Michael Joyce, Dermot Dooley, Jimmy Clancy, Eamonn Mitchell, Martin McGrath, Alfie Smith, Anthony Folan, and John McGrath. In front are Mattie Beatty, Jimmy Joyce, Ivor Carroll, Jimmy Tyrrell, James Nestor, Michael Conneely, Frank Cox, Michael Lydon, and Michael Beatty. Our County players have always been wonderful ambassadors for the game and for Galway so let’s give them all the loud and enthusiastic support with all the colours and banners, flags and klaxons that we can as they head to Croke Park this weekend. Gaillimh abú!